If you are looking for a place to get away from it all with family or friends, then this cabin rental is perfect for you! It is nestled on the bank of a 110-acre watershed lake (Banker's Lake) in western Kentucky. The rental is also pet friendly and only requires one small additional fee. Fishing, canoeing and kayaking are all just steps away from the porch of this rustic getaway. If you enjoy golf, hiking, or just the outdoors in general, you could not ask for a better place. Relax and read a book while enjoying beautiful views of Banker's Lake or just pull up a rocking chair on the front porch and enjoy the peaceful sounds of nature as your daily stresses melt away. 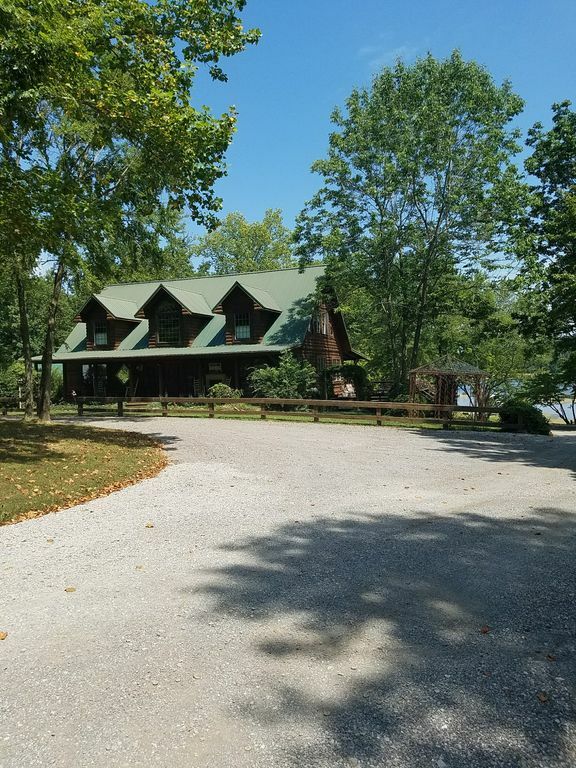 This rental is conveniently located just 10 minutes away from Pennyrile State Park and only an hour drive from Land Between the Lakes (Kentucky and Barkley Lakes). It is less than 10 miles from Burdoc Farm (wedding venue), so it is a great place for out of town wedding guests. The cabin comes furnished with appliances, dishware, gas grill, satellite television (living room only), towels, and all necessary linens. There is also a fire pit in the yard should you want to enjoy roasting hot dogs and marshmallows with friends and family. NOTE FOR PET OWNERS - If you plan to bring more than two pets, please contact owner for a discussion about additional charges for those extra pets. The property owners currently live in the separated walk-out basement apartment of this home. They are a recently retired couple (my father/mother-in-law) and are very friendly and helpful, especially when making sure guests enjoy a wonderful experience. They are willing assist guests with life jackets for kayaks, getting them set up for a fishing, etc, but they are also very mindful that guests are there to getaway, so they keep to themselves and only interact when requested. I promise you, I have never had anything but good comments regarding any interactions guests have had with them. Also, they have a poodle that is outside for potty breaks on occasion, but he interacts well with other animals. Cabin Layout: 1st Floor - Open floor plan with living Room, kitchen, table for 8 that all run together. Then there is a dining room (6 seat table), master bedroom w/ in suite full bath, 1/2 bath located in foyer, laundry room with washer/dryer. 2nd Floor - Bedroom 1 with queen size bed, bedroom 2 with built in full size bunk bed on top and bottom & oversized chair with twin sleeper built in & hidden twin bed in kneewall closet (cool little spot for kids). Loft area bunk bed with full size bed on bottom & twin size bed on top along with a table for board games (several board games for guests use in loft area). Full bathroom. Charming cabin - Indoor and Out! Charming cabin with plenty of space. Very relaxing for our family, including the dogs who loved swimming in the lake. My son tried out the kayak too - in December. Beautiful sunrise over the lake. Hosts very responsive. Only negative was my GPS getting me there. Would definitely book again when I am in the area to visit family. The cabin was so cute and cozy. It was well decorated with cool items that reflect the rustic theme. Well maintained with the guests clearly in mind. Lots of room for many people with a cozy feeling. This was a wonderful weekend with the family! The log cabin was incredible!! The creativity in decor and arrangement were awe inspiring. The home was warm and welcoming in every way - filled with love in every nook and cranny. There was more than enough space for a large crowd and the dishes, seating, and kitchen items were perfect. The only reason I didn't give 5 stars was because the water was not conducive to kayaking and fishing due to a seasonal algae or something very unpleasant on top, but if that had been clear, I would have easily given it 5 stars. Travis was more than accommodating and helpful in every way. I appreciated him going above and beyond to ensure our stay was perfect. Definitely will be booking this property again. We had a wonderful time at the cabin. The cabin itself was amazing. We just loved the rustic vintage decor. We were there for 5 days. We did some hiking at Pennyrile State Park about 10 minutes away. The lake had some awesome bass fishing, but was very weedy and not intended for swimming. We were catching 4-5 lb bass everyday! They did have a small area made into a little beach that our grandkids enjoyed nearly every day. The lake area was also amazing for bird watching. We saw Bald Eagle nearly everyday and many others as well. Travis answered all our questions, and took good care of us. We had no real issues of things that went wrong. We used the kitchen a lot and some meals were prepared on the gas grill. We had 7 adults and 3 small children. Plenty of room for all. The beds were very good, good bathroom space, lots a lots of good books to browse, games to play, and on and on. We were a bit overwelmed at first but soon just relaxed and enjoyed very much all the cabin had to offer. While we were there the temps were in the 90's but the AC cooled all areas of the cabin well. Every morning my wife would find a new quiet place to start the day. She especially liked the back deck and porch swings and rockers the cabin offered. I think there were 3-4 swings and many rockers to relax. Amazing!! We would definately consider use this cabin again. Thank you, Thank you! !